Inglewood Lavender producers Matthew and Kellie Oxenford from Leven K Lavender have once again attained FIRST place at the 20th annual Australian Lavender Growers Association Inc. (TALGA) for two different lavender essential oils. The 20th Annual Conference was held in Ballarat VIC on the 15th & 16th April 2015. The competition is held annually to encourage members to achieve proficiency in both scientific and olfactory analysis. The awards encourage best practice approach to the management of the raw product. TALGA, Australia’s premier, not for profit lavender association continues to promote a Best Practices concept that covers everything from farm business techniques, label design, oil distillation practices and product presentation. Matthew & Kellie are absolutely delighted to once again receive this recognition for their Lavender oils. 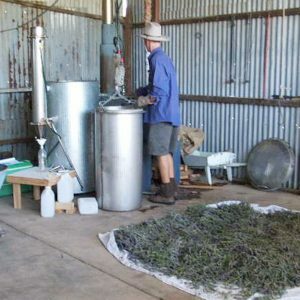 Previously winning the award for their angustifolia oils in 2005, 2007, 2008 & once again in 2015 has confirmed the place of Leven K Lavender as a top quality lavender oil producing business in Australia. 1st prize for Lavandula angustifolia ‘Maillette’ – Lavandula angustifolia oils are considered as ‘perfume’ grade oils, with low camphor and a sweet honey like perfume.